North SpainSan Sebastian - 5 Star. This 5-star hotel is located opposite San Sebastians Victoria Eugenia Theatre, with views over the Cantabrian Sea and Urumea River. The air-conditioned rooms include flat-screen satellite TV. Their marble bathroom comes with a separate bath and rain-effect shower, double sink..etc. North SpainSan Sebastian - 4 Star. Palacio de Aiete offers a gym and rooftop sun terrace, with panoramic views over San Sebastian. Each bright room includes flat-screen satellite TV and free Wi-Fi. Typical Basque cuisine is served in the hotel's elegant restaurant. The Palacio de Aiete also has a coffee shop with a garden courtyard. This design hotel has a seasonal outdoor pool. Barcelo Costa Vasca is 600 yards from San Sebastian's Ondarreta Beach, next to Miramar Palace and Gardens. Rooms at the Costa Vasca are bright and minimalist, with lots of natural light. All rooms include a minibar and a safe, while some rooms feature a private balcony. The hotel NH Aranzazu San SebastiÃ¡n Collection is an elegant and quiet woods and timeless decorated with marble. Located in one of the most exclusive neighborhoods of the city, surrounded by some of the most splendid houses in the area. rest and relax thanks to special lighting effect in every room integrated bell. Iriarte Jauregia is a beautifully restored 17th-century palace is located in fabulous Basque countryside, San Sebastian is 37 miles from the hotel. Nineteen rooms featuring a unique character and splendid views, with materials, textures, colours and details that make every stay a fantastic experience. Luxurious rural hotel located in an area of natural beauty, surrounded by vineyards with breathtaking views of the Raton de Getaria. Each room has a different view of the picturesque surroundings, a special place to rest, relax and enjoy the silence. Our swimming pool, built over the ruins of the original Iturregi farmhouse, is the ideal place to relax. This hotel has modern decor and is located in the industrial area of Urnieta just a 7 minute drive from the city of San Sebastian. Wi Fi and air conditioning. Rooms at Hotel K10 plenty of natural light and include flat-screen TV, minibar and private bathroom with hairdryer and free toiletries. 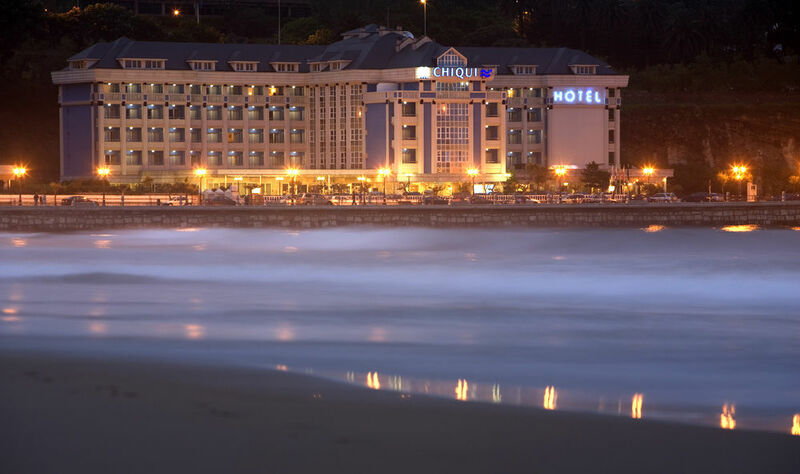 Zenit San SebastiÃ¡n is a 4-star hotel located in the area of Morlans, this romantic hotel is within 1 mi (2 km) of Parque Aiete and Concha Beach. Featuring a rooftop sun terrace with a seasonal hot tub, Each air-conditioned room is soundproof and comes with a flat-screen satellite TV, a minibar a laptop safe. This property is 17 minutes walk from the beach. The Astoria7 is themed around cinema and the San Sebastian Film Festival. Each room offers free Wi-Fi, flat-screen TVâ€™s and is dedicated to an actor or director who has visited the city. North SpainSan Sebastian - 3 Star. Located just 250 yards from Ondarreta Beach, Sercotel Codina offers modern air-conditioned rooms and free WiFi. All the rooms come with a minibar, flat-screen satellite TV and private bathroom. Some superior rooms have a terrace. There is a TV lounge and a cafeteria. Guests can also order pizza to their room. North SpainSan Sebastian - 2 Star. The Hotel Rural Gaintza is among the wineries and vineyards of Txakoli Gaintza. It offers magnificent views of the mountains, free Wi-Fi, free parking and daily breakfast. The hotel is just 10 minutes' walk from the fishing village of Getaria. North SpainSantander - 4 Star. Located in the most beautiful corner of the Sardinero Beach, Enjoy spectacular views of Magdalena Palace, the island of Mouro and open Sardinero. An unforgettable experience in its 161 rooms with views of the Cantabrian Sea , full of natural light, decoration and exquisite cuisine .